Operating Era: 1918-1965. Florida East Coast. THIS SERIES NOW COMES WITH OUR ONE-PIECE ROOF FRAME. FEC had extensive fruit and sugar service with Cuba in the early decades of the twentieth century. 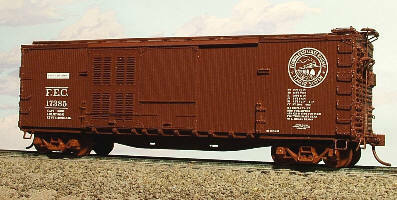 In 1920 its steamship subsidiary ordered 500 ventilated box cars modified from the USRA DS box car design. A second door was added to each side. These doors had four sets of radiator vents backed by screen. Each end had a pair of four-fin closeable vents. When used in suger service these vents were covered by a plate to prevent leakage. The cars were lettered with the distinctive overseas herald. In about 1930 the cars were rebuilt with stronger radiator vents in the doors, heavy door bumping posts and a roof line fascia. They ran until 1936 when the were sold.